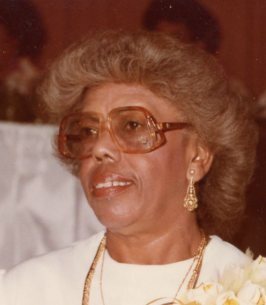 Warna Irby Service Details - Greenville, South Carolina | Watkins Garrett & Woods Mortuary Inc.
Mrs. Warna McKinley Irby, 89, of Greenville, South Carolina, departed this life on Monday, October 22, 2018, at McCall Hospice House. She was born in Spartanburg, South Carolina, on March 26, 1929, to the late Willie and Queen Briggs McKinley Wilson. The family moved to Greenville where she became a member of Israel Chapel CME Church. She was educated in the public schools of Greenville County. Warna graduated from Benedict College in Columbia, South Carolina, and became a teacher in Cosmetology. She taught in Florence, SC and Washington, DC. She was past superintendent and other offices of Israel Chapel CME Church, she also was a member of the Delta Chapter and President of the Beautician Protective Associated League 265. She loved the Lord, her family, her Church and people. She loved saying, “Yes in deed” and “O yeah”. She was preceded in death by her husband, Melvin Irby; a son, Melvin Tazwell Irby; and a brother, Elijah (Billy) McKinley. She leaves loving memories to her son, Charles Irby of the home, one sister, Carolyn (Charles) Culver of Washington, DC; one brother, Willie (Tiajuana) McKinley of Washington, DC; three grandchildren, Ashley Monique Irby of Charlotte NC, Cory Irby of Greenville, SC, and Warren M. Irby of Baltimore, MD; special nieces, Cheryl McHill of Huston, TX and Rosiland McKinley of Greenville, SC; a devoted cousin, Bernice Ferguson of Greenville, SC; special friends, Mr. & Mrs. Charlie Turner and Laura Ann Smith; and a host of other nieces, nephews, cousins and friends. We encourage you to share any memorable photos or stories about Warna. All tributes placed on and purchased through this memorial website will remain on in perpetuity for future generations. Please accept my heartfelt condolences on the loss of your beautiful loved one. When you see someone that has lived such a long and fulfilling life, one may wonder why man has to die at all. But be assured, God gives us his personal promise found in the Bible at Revelation 21:4, where God tells us that very soon he will do away with death and sickness from the Earth forever, and then he will resurrect Warna to perfect life here on Earth, surrounded by family and friends, which has always been God's purpose for mankind and for his Earth. Too many times I was going to pick up the phone to see how you were doing. Now I have to say good-bye without you hearing my voice. Rest in Peace Auntie! Though now you are grieving, please remember that you are not alone. Psalm 46:1 says, "God is our refuge and strength, a help that is readily found in times of distress." He will really help you (Isaiah 41:10) He will give you the strength, because He cares for you (1 Peter 5:7). I am sorry for your loss of your love one, Ms.Warna Irby. Expressing my sincere condolences to the family. May the God of all comfort sustain each one of you during time of grief. 2 Corinthians 1:3,4.